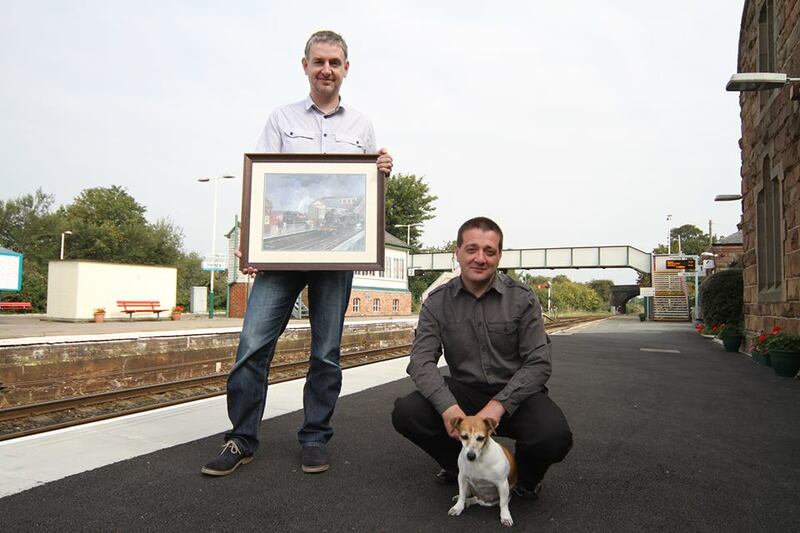 Railway Artist Nick Harling made a return visit to Helsby Station on Friday 5th August to see "Pip's" (The Railway Dog) memorial and deliver the third and final print of "Pip". Nick famously painted "'Pip" in 2014 for the painting of Helsby Station entitled "Between Showers" which was commissioned to celebrate the completion of major refurbishment at Helsby Station and was limited to just 25 prints a copy of which is on display at the booking office at Chester Station. 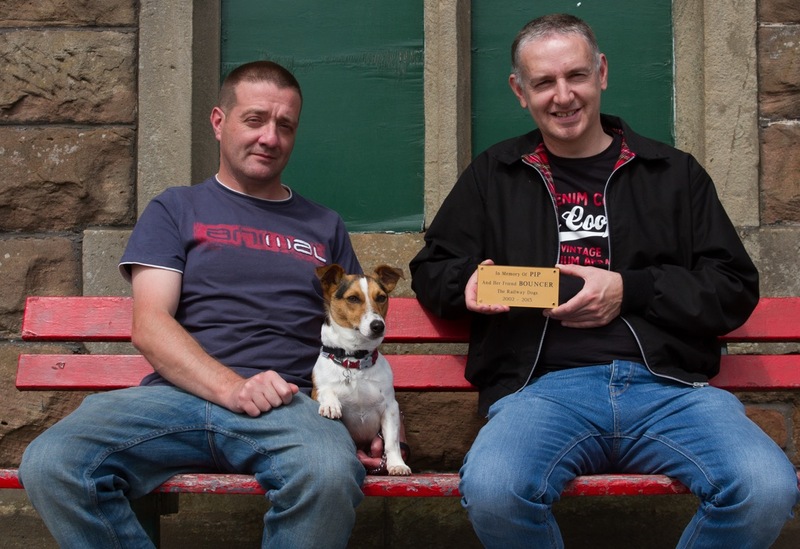 Nick unveiled a small brass plaque during his visit that will be placed at Llangower Station on the Bala Lake Railway where "'Pip'" was laid to rest last October. Nick was also presented with a copy of Pip's Book "Railway Legend and adventurer". Nick also met "Rusty" for the first time who is Ian Whitleys new faithful companion. He is a rescue dog and his age is unknown but he is already following in the footsteps of "Pip" on the railways. In a fitting tribute; he features alongside "Pip" in the third and final painting of the series. The Memorial Fund for "Pip" now stands at £1,555.45. Funds have been donated to the Bala Lake Railway where Llangower Station will be refurbished with a new picket style fence. Chester Zoo has also benefited. Here the money will be used to research Elephant Endotheliotropic Herpesvirus (EEHV). It is a deadly virus which affects young elephants typically around weaning age. The Zoo has lost five young elephants to EEHV, most recently the female calf "Bala", followed just six weeks later by playmate "Hari" just before his third birthday. The Fairboune Railway has also benefited with a small donation. 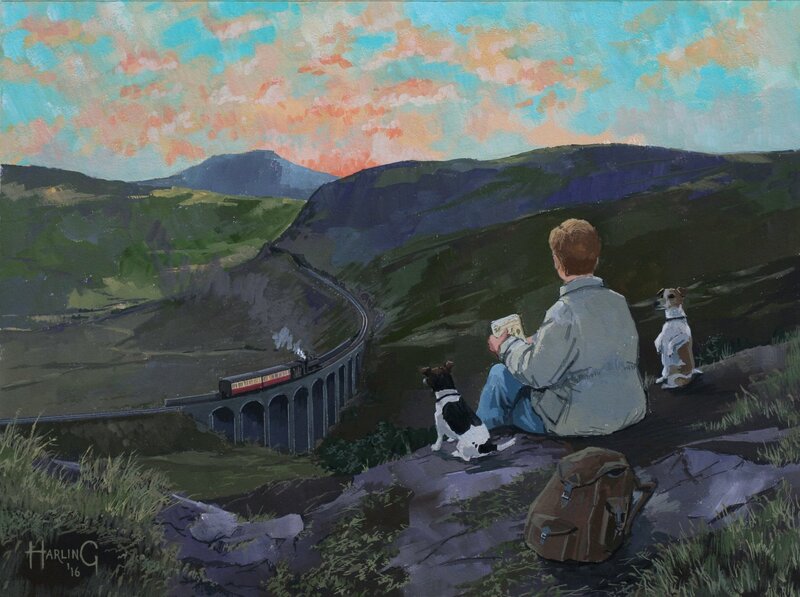 "Pip's" final artwork is set on the old Bala to Blaenau Ffestiniog Railway line near Cwm Prysor Viaduct. The print run limited to just 15 copies, sold out within a week of going on sale. Nick announced during his visit that "Between Showers" the first painting and the one featuring Helsby Station is to be reissued in the New Year, as a non signed, non numbered smaller edition, so as not to affect the value of the original prints. All funds from the print will go to NCRUG. Price to be arranged. Please contact our recruitment office for further details. Finally, you may have noticed the name Bouncer on the brass plaque that will be erected at Llangower on Bala Lake Railway. This was Ian’s first terrier. She passed away in 2001 aged 13 having spent a considerable amount of time on the railways. Ian kept her ashes for many years looking for a suitable location to scatter them. Her ashes and Pips were scattered at the same time at Bala last October. The plaque gives a nod to both Terriers.